I’ve read quite a few articles on nursing in public lately. From sentimental to logical to fiery & religious, there’s a lot to be said on feeding baby around town. 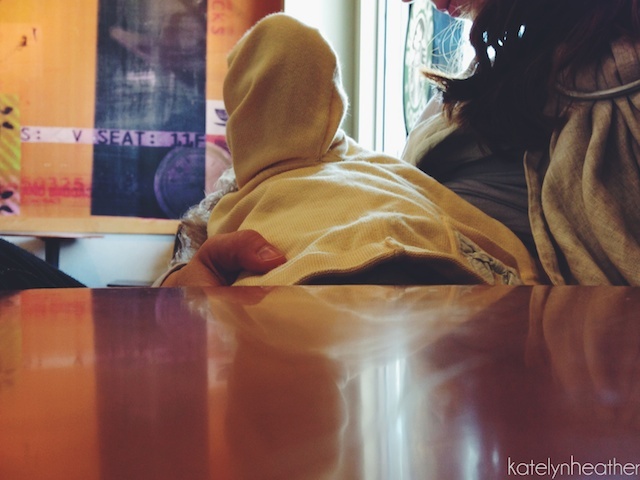 Several weeks ago I was at Disney and sat down by a mom who was nursing her baby (with a cover.) We casually began talking about how old our babies were when she made a comment like “I feel so weird, I never do this in public.” And I just felt sad for her. For moms everywhere. And what it really makes me wonder is why do we feel like there is something wrong or dirty or private about breastfeeding? Historically breastfeeding has been way more socially accepted than it is now. Women in very modest cultures breastfed openly without concern (I love this photo of this mother in the 1800’s. Does she look like she cares? Nope.) It was the normal thing to do. Then somewhere in the past century or so American women for the most part stopped breastfeeding. And unfortunately it seems that we subsequently have forgotten that breasts have a purpose. I imagine you already know that breastfeeding is important. So for us to create a culture where moms receive the support they need rather than being ostracized for doing what’s best for their children, our collective perception need to change. A big part of the nursing in public debate seems to dwell on modesty. And I really do believe in modesty. But while I recognize that each unique culture has it’s own definition for that, I don’t believe that nursing in public is even an issue of modesty. It’s just feeding a baby. I hope that someday we have a culture where nursing is so common that no one bats an eye when a mother feeds her baby in public. That it would be expected. As normal as seeing someone with a bottle of water. A baby on the breast. Babies need to eat. But to be honest with you, once in awhile I feel uncomfortable feeding my baby when we’re out of the house. Sometime I wonder what people are thinking, or if they’re “offended”. Occasionally I use a cover (our sling), most of the time I don’t (it’s hot, and distracts her so she won’t eat anyway.) But what I remind myself is that when I breastfeed my baby, I am helping to create that culture. The more mothers who do, the more normal it becomes. I know you may have different opinions. I typically avoid writing about “confrontational” topics because I just don’t like conflict. But I really believe this is important. That if we can change our perceptions, we will create a culture where nursing is the norm. For healthy babies, and healthy moms. It’s really matters. This is soooo controversial and like you said, it shouldn’t be. A baby needs to eat. They don’t understand what’s public or private. With Elora, my first baby, I didn’t have a cover, didn’t know about those things. I felt very uncomfortable nursing in public so I would go into the restroom or find a private corner and put a scarf over us. With Salem, my second child, I discovered Bebe Au Lait nursing covers and they were a huge blessing. I was nervous at first about nursing in public but it gradually got easier ms to the point where I didn’t care what people thought. I needed to feed my child.